A murder of crows can be an intimidating sight, but there's no need to be scared of them. Ravens, also known as crows, aren't always the horrible monsters that many people think they are. There's much more to these misunderstood birds than what meets the eye. First and foremost, the Raven is known as a trickster, a thinker, and a strategist. There's no plot or tight situation that he can't formulate a way out of. In no other culture are ravens more respected and revered than in the Native American tradition. For the Haida to the Kwakwaka'wakw, the Raven is seen as both a Creator God and a trickster. The Raven is also a Keeper of Secrets, a title given to acknowledge the bird's mental prowess. Countless stories abound in which the clever Raven uses his wit to outsmart formidable foes. The Tlingit people of the Pacific Northwest speak of the Raven as one of the ancient deities who brought light (which can be interpreted as wisdom), the Sun, the Moon, and the Stars to the dark and ignorant world by tricking the Seagull into opening its box of gifts. Thanks to the Raven, the first day was able to begin, which, in some circles, has been interpreted to mean that the animal brought knowledge to the ancient tribes. In many tales, the Raven is known to morph into another being in order to carry out his tricks, making the animal an ideal totem for Transformation. Ravens have had central positions on countless battlefields throughout history. They are carrion feeders, as such, they are closely associated with Death. In fact, it is a commonly held belief that seeing a raven in your house meant that death was imminent. This concept became the crux of Edgar Allen Poe's most famous poem, The Raven. Here, the Raven provides the central character of the piece with the opportunity to communicate with his dead lover and explore his own fears about the Afterlife. The fact that ravens spend much of their time hanging around rotting flesh makes these birds a bad omen and to many the animals are foretelling the approach of perilous times. Ravens are seen as guardians of lost souls. To the Sweds, ravens are the ghosts of murder victims and Germans see ravens as the souls of the damned. Ravens were the first totems of the Celtic goddess, Morrigan, the queen of the battle and war. This link is likely due to the fact that ravens were common on ancient European battlefields, scavenging the bones of dead soldiers. This legend can also be found in Norse mythology. Odin's daughters, the Valkyrie, have the power to decide who lived and who died on the battle field. The Valkyries were often shown riding into battle with ravens at their side. Even Odin himself was always accompanied by two ravens: Huginn and Muninn. One controlled the process of thought, while the other oversaw the deeper workings of the mind or memory (intuition). The pair was Odin's mythological Google, gathering information from across the entire world and bringing it to Odin's fingertips. But Odin was not the only deity to gather information in this manner. Ravens were the messengers of the Greek god, Apollo, along with swans, hawks, and wolves, but one legend has it that they lost this lofty position because they were chatterboxes. Their chatty nature has gotten them in trouble in several other folklore traditions. According to the Greeks, ravens were once pure white birds, but they spoke one too many times out of turn and were cursed. Their feathers were turned black as a sign of their misfortune. A Christian version of the story says that after the great flood in the story of Noah, the raven got its black feathers as a punishment from God because they failed to return to Noah after they were sent out to see if there was dry land. In Pagan traditions, ravens are seen as "familiars", animals that are spiritually bonded to witches - much like a black cat would be. By connecting with a powerful animal spirit, pagans believed that this would ground them with the primal energy of Mother Nature, making them more rounded, stronger beings. The Raven is a wiccan messenger with the ability to move between the physical and the spiritual realms with easy and grace. In the European context, these birds are seen as guardians and protectors closely linked to the Welsh god, Bran the Blessed. According to the legend, his head was buried in the White Hill of London (under the watchful eyes of his beloved ravens) as a means of thwarting any future invasion of Britain. His head was removed by the legendary King Arthur, but the ravens remained at the site, which is said to be where the Tower of London now stands. As long as the ravens remain undisturbed at the Tower of London, then England would never fall victim to invading forces. Whether or not there is any truth to this superstition remains unclear, but one thing is clear, in its long history post the days of the Roman Empire, Britain has yet to fall to outside invaders, and yes, a murder of crows still officially call the Tower of London "home". The Raven is truly a Jack of all Trades. He moves throughout the day, bringing both life and Death to humans while keeping a watchful eye on the world that it has helped to create. Raven personalities are complex and contradictory, just like their animal totems. Raven Tattoos are very rarely colorful and chirpy. Our preconceived perceptions of these animals are dark and ominous, therefore bright blues and happy yellow colors play a minimal role in these designs. In most case, the Raven is shown keeping a watchful eye on things around it while perched on a branch or some other object, reinforcing the traditional image of the bird or the animal may be portrayed in flight. From the Haida to the Lakota, the Native American culture is richly mixed with tributes and stories about the noble Raven. In this context, ravens are seen as tricksters. But Native American Indians are not the only ones who have found deeper spiritual meaning in tribal images of the Raven. This animal pops up in cultures across the globe, from the Celts to the Norse, and is revered for its intelligence. 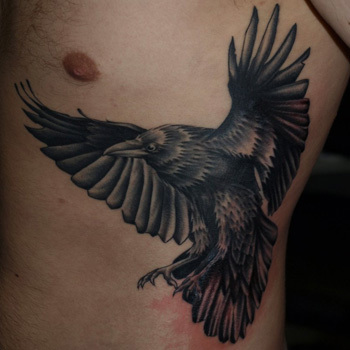 Tribal Raven Tattoos are cool ways to show your respect for the spiritual nature of these fine animals. The Wolf is a key figure in Native American lore, much like the tricky Raven. Both animals are revered for their intelligence and possession of ancient knowledge. They are also renowned for being sly tricksters, clever survivalists, and skillful shape-shifters. The Wolf and the Raven are always engaged in a mental battle to test who is the smarter animal. In some stories, the Wolf prevails, in others, it is the Raven, and in some tales, both animals team up for the benefit of the human race. The Raven is a Keeper of Secrets, whereas the Wolf is the Custodian of Ancient Wisdom. The Wolf and Raven Tattoo is a tip of the hat to the Native American tradition. This also means that you have links to ancient Germanic paganism, since these totems, the Wolf, the Raven, and the Eagle, are engaged in a tireless battle against evil. Pay homage to your intelligence, cunning, and wit with a Raven Tattoo. These birds are more than just clever tricksters; they are keen survivalists and revered totems of the gods. Raven Tattoos tend to have a dark reputation, but that doesn't mean that they are solely reserved for grouches and Negative Nellies. If you want to create a great Raven Tattoo, then visit our site at www.itattoodesigns.com. Our team of talented artists can cook up a design that is truly breathtaking. Simply take advantage of our Custom Design Service.